Breaking down the running backs situation, Brian Ferentz's contributions and the genesis of a top-10 national defense. IOWA CITY, Ia. — It was Coordinators Wednesday at the Iowa Football Performance Center, this being the 12th-ranked Hawkeyes' only idle week of the regular season. And not once in his 20 minutes at the podium was Greg Davis’ future as offensive coordinator mentioned. And why would it? The Hawkeyes are humming along at 7-0 and are firmly atop the Big Ten Conference’s West Division. To say Davis’ first three years as offensive coordinator were embattled would be to say Bernie Sanders leans politically to the left. But Year 4 has come with few valid complaints surrounding Iowa’s offense. The Hawkeyes are averaging 32.9 points a game, with the big upgrade coming in the rush offense. Iowa’s per-carry average is 5.0 yards, compared with 4.1 in 2014 — and that was with Outland Trophy winner Brandon Scherff at left tackle. “Anytime that your line can take a ballgame over, it's a great feeling (as a play-caller),” Davis said. Davis was asked about this being a personally rewarding season, but he side-stepped the opportunity to gloat to media that's been hard on him at times. Davis and head coach Kirk Ferentz both were worried about Akrum Wadley’s ball security. But they aren’t anymore. It was interesting to hear Davis say that running backs coach Chris White “had been kind of beating the table” on Wadley’s behalf after LeShun Daniels Jr. (high ankle sprain) was shut down prior to the Wisconsin game. But it wasn’t until Saturday’s 40-10 win at then-No. 20 Northwestern that the leash came off Wadley, who relieved injured Jordan Canzeri to rush for 204 yards and four touchdowns on 26 fumble-free carries. “It certainly made us feel better that we came out of the ballgame and he had carried it over 20 times and not once was it close to coming out.” Davis said. How will RB rotation play out? Davis was hopeful Daniels would be 100 percent by next week, at which point they’ll evaluate workload for the Oct. 31 game against Maryland. Canzeri (left ankle sprain) probably won’t be back, so how will the carries be dispersed between Daniels (the preseason No. 1 who rushed 26 times for 123 yards in his only full game against. Illinois State), Wadley and Derrick Mitchell Jr.? Officially: To be determined. But Davis said he preferred to have a two-back combo and then a third-down back. So, reading between the lines, that could be a Daniels/Wadley hot-hand time-share, with Mitchell (10 carries, 79 yards at Northwestern) in the third-down role. Canzeri had become Iowa’s featured and third-down back until getting hurt. “Early in camp, we thought that (third-down guy) would be Derrick Mitchell, and he's been kind of dinged up,” Davis said. Dowling Catholic product Ryan Boyle would have been the next man in at Northwestern if both C.J. Beathard and redshirt freshman Tyler Wiegers got hurt. Davis said Boyle was getting a lot of reps with the No. 2 unit last week with Beathard (groin) not practicing until Friday. “But I wouldn't read a lot into that, quite honestly,” Davis responded on whether Boyle had beaten out fellow true freshman Drew Cook of Iowa City Regina. The plan is for both athletic quarterbacks to stay at that position, Davis said. The plan also is to redshirt both. But Boyle seems to have emerged as the emergency option. 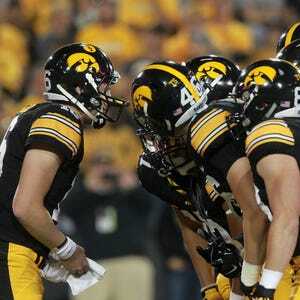 Is Brian Ferentz pulling the offense's strings? A lot of people want to give credit to Iowa’s resurgent running game to Brian Ferentz, who was named run-game coordinator in February. Both Ferentzes have insisted the move was more “clerical” than anything, and Davis reiterated that Wednesday. “There hasn't been a bunch of change, quite honestly. The line coach, at least in the places I've been, has always kind of been the run-game coordinator, whether or not there was a title or not,” Davis said. “Brian is an extremely bright guy and has done a great job with the line." Next question: Will Brian, 32 and a four-year assistant under Bill Belichick with the New England Patriots, be a head coach someday? Iowa defensive coordinator Phil Parker’s 18-minute meeting with reporters was spent mostly bouncing around the depth chart. There are pretty much only good things to discuss with a defense that ranks fourth nationally against the run, 10th in points allowed and 12th in yards allowed. Oh, and it leads the Big Ten with nine interceptions — six from Desmond King. Iowa is plus-six in turnovers in its 3-0 Big Ten start, something that began with a “scoop and score” mentality in practices during spring practice with any loose ball. That can annoy the offense in practices. “Sometimes guys get mad that we're taking it back and all that, but it’s just a habit that they created,” Parker said. “… Even during the games, the guys are picking up the ball, even though it's an incomplete ball and the ball is dead. Who's the MVP on defense? Parker was asked to pick a defensive MVP. He couldn’t. A strong case could be made for King, defensive tackle Jaleel Johnson or middle linebacker Josey Jewell. Parker has been with Ferentz all 17 years at Iowa, the last four as defensive coordinator. What he’s seen behind the scenes brings back memories of the Hawkeyes’ two Big Ten championship teams under Ferentz. True freshman Jack Hockaday had his redshirt pulled at Northwestern. Parker said the decision had been simmering since preseason, but injuries sidelining special-teamers like defensive end Drew Ott triggered the move. Parker said Hockaday (6-foot-1, 215 pounds) projects at weak-side (Will) linebacker, where fifth-year senior Cole Fisher currently starts. Don’t be surprised if he battles for a starting role alongside Jewell and Ben Niemann this spring. The play of junior Johnson and sophomore Nathan Bazata, Iowa’s starting defensive tackles, might be No. 1 on the Hawkeyes’ long list of pleasant developments. Two more juniors, Faith Ekakatie and Kyle Terlouw, have gotten time as backups. So defensive tackle appears in good hands for this season and next. But down the road? Parker brought up true freshman Michael Slater (6-2, 265), who was a stand-up linebacker at St. Louis’ Parkway Central High School, as a developing run-clogger. “He looks like he has a lot of potential, and we worked some of those guys today (in practice),” Parker said. “We're looking forward to seeing him coming on. I think he has a promising future.